Does your dog have a tummy rash? Whether you're a new pet owner or a long time friend, learning how to identify a dog rash and how to provide relief are two excellent skills to know. There are many reasons for dog rashes; when dogs lie down, their stomachs are in contact with whatever surface they're on — so they're exposed to household chemicals, outdoor irritants or insect bites, all of which can lead to rashes. Most rashes are harmless and can be treated with topical ointments, but some skin irritations signify serious conditions. If your dog is scratching persistently at a rash and it doesn't go away after a few days, take your pet to be evaluated by a veterinary expert. Young puppy getting his stomach scratched. It's important to look for ticks and other bugs when you walk your dog in tall grassy areas. Ticks, fleas, mites and chiggers can all cause stomach rash on a dog. Not only do the bug bites lead to raised welts and itchy skin, but your dog's licking and scratching of the area can also lead to dry and irritated skin or hot spots that exacerbate the problem. You can treat these insect-based rashes by first identifying and eradicating the parasite problem, thoroughly cleaning your dog's bedding and washing his stomach with an antibacterial soap. A topical anti-itch cream or prescribed cortisone cream can further soothe itchy skin irritation. Your dog's stomach rashes can be treated with anti-itch cream prescribed by your vet. Just like a human, your dog may be allergic to something the skin of his sensitive stomach comes in contact with. These allergies could be sap from a tree, poison from a plant or yard fertilizer, or it could be a carpet, floor or household cleaner. While allergic rashes can typically be treated easily enough with topical creams or vet-prescribed antihistamines, narrowing down and avoiding the cause of the irritation can be tricky. Consider using pet-safe supplies in your home and garden to reduce the potential for rashes and accidental poisoning. Look out for your four legged friend reacting to symptoms like blisters or rashes. Folliculitis is a bacterial infection and may follow other skin problems that result in scratching and raw, exposed skin, according to Animal Wellness magazine. Symptoms include sores, raised welts, scabbing or scaly skin. Fluid-filled blisters on the stomach can be a symptom of another bacterial problem, impetigo, which is most commonly seen in puppies. Your vet may treat both disorders with medicated shampoo or antibacterial gel. An antibiotic may be needed to treat infection. 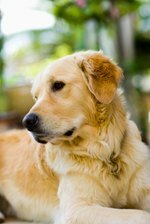 Folliculitis symptoms include painful sores on dogs; this can be treated with medicated shampoos and more. The Merck Vet Manual also describes how skin conditions can signify serious underlying medical conditions, such as internal parasites, strongyloidiasis, mange or an uncontrolled infection. If your dog experiences sudden changes in his coat or skin, particularly if the change is accompanied by other distressing symptoms like vomiting, bloody stool or a change in appetite or demeanor, seek veterinary attention immediately. Check with a vet if any serious conditions develop.